If you’re on the keto diet, you know there are lots of things to be thankful for, like that fact that you can still eat cheesecake! While many diets deprive you of your favourite foods and desserts, the keto diet helps you lose weight while allowing you to eat the foods you love. No bake keto cheesecake is one of the delicious desserts you can indulge in on keto! Take a look at our favourite recipes that you can enjoy guilt-free. The keto diet is an eating plan that has been making waves in the health and diet industry. People have praised the keto diet for not only helping them lose weight, but saving their lives. It’s a low carb, high fat diet that forces your body to burn fat for fuel. With the elimination of carbs (your body’s typical fuel source), your body has to look elsewhere to keep it fuelled and energized. The reduction of carb intake places your body into a metabolic state called ketosis. While in ketosis, your body becomes very efficient at burning fat for energy. It also turns fat into ketones in the liver, supplying energy for the brain. The keto diet isn’t just great for weight loss – it makes you more energized, mentally alert, and has plenty of health benefits! When you first start on the keto diet, curbing cravings for sugar and carbs can be challenging. High carb foods like bread, pasta and sweets tend to be addictive and lead to you craving more of them, so it’s normal to feel an urge to eat them. Here are six of our best tips to banish carb and sugar cravings! The best way to stop yourself from eating carbs and sugar? Get rid of temptation! Clean out your fridge, pantry and cupboards and get rid of anything that you can’t eat on the keto diet. It’s harder than it seems to stop yourself from eating something that’s right in front of you, and when you have a craving, it can all go downhill if you have chocolate bars in the fridge or muffins on the counter. One of the main reasons people fail on the keto diet is they limit carbs too slowly. The more carbs you eat, the more you’ll crave them, so it’s best to go cold turkey! Most people reach ketosis by limiting their daily net carbs to 25g. Cutting carbs cold turkey is the fastest way to reach ketosis and will also help you eliminate cravings! Although they have low nutritional benefits, carbs do a good job filling you up. Fiber does the exact same thing, plus it’s much better for you! Fiber takes a while to pass through your system, making you feel less hungry, crave fewer carbs and eat fewer calories. It also helps your digestive system, so all in all, it’s a great nutrient to increase in your diet. The signs of dehydration are very similar to the signs of hunger, so if you’re craving carbs, you may actually be craving water. If you notice you’re experiencing fatigue, headaches, lightheadedness or trouble concentrating, a glass of water may help! It’s important to keep hydrated throughout the day, so when you feel hunger or cravings come on, reach for a glass of H2O. It may be hard, but it’s so important not to cheat while on the keto diet, especially the first week! If you succumb to your cravings, they won’t go away – they will become stronger each time you fall under their spell. You’re likely going to kick yourself out of ketosis if you end up caving to carb and sugar cravings, so try your best not to cheat! If you do, make sure to go back to eating keto approved foods as soon as possible. The great thing about keto is that you can still eat keto dessert like no bake cheesecake! When you’re in the mood for something sweet and carb-like without the guilt, no bake cheesecake is the way to go. It will allow you to taste the goodness you’re craving without adding to your waistline! Keto dessert is one of the best parts of the keto diet, and these no bake cheesecake recipes are sure to keep you satisfied when you get a craving for something sweet! 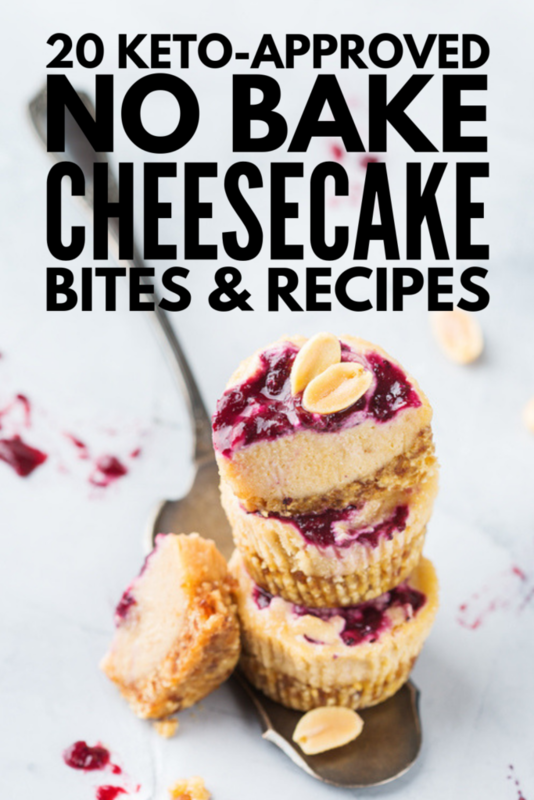 Did you love these no bake keto cheesecake recipes? Make sure to share this image on Pinterest! And if you’re looking for more delicious keto recipes, go on and follow our Keto Board on Pinterest!